Taking care of your pet’s teeth is more than fresh breath and clean teeth; it’s a serious health issue. Too few pet owners consider their pets’ teeth when considering their overall health yet a scary 85% of pets suffer some form of dental disease after the age of three. Bad teeth not only cause pain, they can also lead to more serious illnesses like heart disease and diabetes. Bacteria from dental infections triggers the immune system leading to inflammation. The more inflammation, the greater the chance that bacteria enters the bloodstream and travels to other parts of the body. This causes damage to other organs. Reducing inflammation by treating dental disease has a profound impact on your pet’s health because it decreases the amount of work the body has to do to fight infection. The risk of some heart diseases is as much as six times higher in dogs with stage three dental disease than for dogs without it. Diabetic pets tend to have higher levels of dental disease; the more serious the dental disease, the worse the diabetes and so on. The inflammation and infection associated with dental disease decrease the body’s sensitivity to insulin. It is therefore very difficult to treat a dog’s diabetes until the dental disease is treated. Once the tooth is treated, the diabetes is easier to stabilise. Pets, and especially cats, rarely show that they’re in pain even when they’re eating and because of this dental disease is often known as a ‘hidden disease’. Sometimes dogs may drool, stop eating or appear to have swollen or bleeding gums but this isn’t always the case and by the time these symptoms appear, it is too late to save the tooth. Astonishing as this may seem, poor oral hygiene can result in a broken jaw in dogs, especially smaller breeds with disproportionately large teeth, such as Chihuahuas, Lhasa Apsos, Maltese, and Shih Tzus. Infection to these dogs’ mouths can weaken their relatively small jaws and something as simple as jumping off the couch can lead to jaw fracture. It is a difficult fracture to heal because the bone isn’t healthy. The most effective way to prevent these conditions happening to your pet is to keep their teeth clean and disease-free. This should include regular cleaning of your pet’s teeth and gums. The earlier you introduce teeth cleaning to your pet, the easier it is. Start by allowing them to chew on a pet-friendly toothbrush. 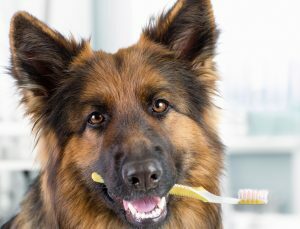 Find pet toothbrushes and toothpaste at EberVet Vetshops. Once they’re used to this playful chew session, introduce a tiny bit of pet-friendly toothpaste. It’s specially manufacturered to appeal to their tastebuds. Do this at least once a day. If your dog is already an adult, adopt the same regimen but add pet-friendly chews and toys as added incentive to work plaque off the teeth. EberVet Vetshops stock a wide range of healthy chews and biscuits designed to loosen tooth plaque. 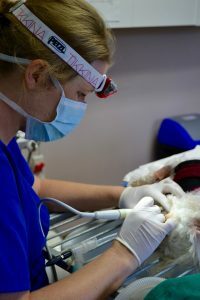 Should your dog need dental work, this will be done under anaesthetic by your vet. Country Animal Clinic is running a dental special in April and May; 30% off the usual fee for all pets. Take advantage of this special offer and book your appointment now.